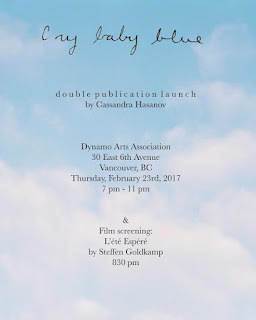 Print Ready 2017 includes recent publications by Marc Bell & Owen Plummer, Stephane Bernard, Kyle Buds, Cabin Collective, Sarah Ellis Clark, Jo Cook, Zandi Dandizette, Sylvana d'Angelo, William Dereume, Ben Duncan, Carli Erin Boisjolie, Gave and Took Press, Jaz Halloran, Kristen Hatfield, Cassandra Hasanov, Neoglythic Media, Miriam Levine, Sarah Lowenbot, Juli Majer, Tylor MacMillan, Caitlin McDonagh, Drew Miller, Cole Pauls, Perro Verlag, Laura Perry, Phaedra Harder & Stephanie McDonnell, Sonya Ratkay, Sylvie Ringer, Sandra Sanchez, Joel Skavdahl, Sarah Sinner, Melanie Thibodeau, Erica Wilk, & Zine Club. Neoglyphic Media (Bellingham Washington) will present their brand new issue of Emergence: Cover by Drew Miller, with additional contributions by Theo Ellsworth, Danielle, Nou, Ben Duncan, Joel Skavdahl, Wyatt Hersey, Ben Nadler, and Vinnie Neuberg. Zine Club will present an installation featuring a curated selection of international digital and print artists from its collective. Announcing Artists for Print Ready 2017! Marc Bell, Stephane Bernard, Kyle Buds, Cabin Collective, Sarah Ellis Clark, Zandi Dandizette, William Dereume, Ben Duncan, Carli Gaudet, Gave and Took Press, Kristen Hatfield, Cassandra Hasanov, Neoglythic Media, Miriam Levine, Sarah Lowenbot, Juli Majer, Tylor MacMillan, Caitlin McDonagh, Drew Miller, Cole Pauls, Laura Perry, Phaedra Harder & Stephanie McDonnell, Sonya Ratkay, Sylvie Ringer, Joel Skavdahl, Melanie Thibodeau, & Zine Club. More to be announced soon!! 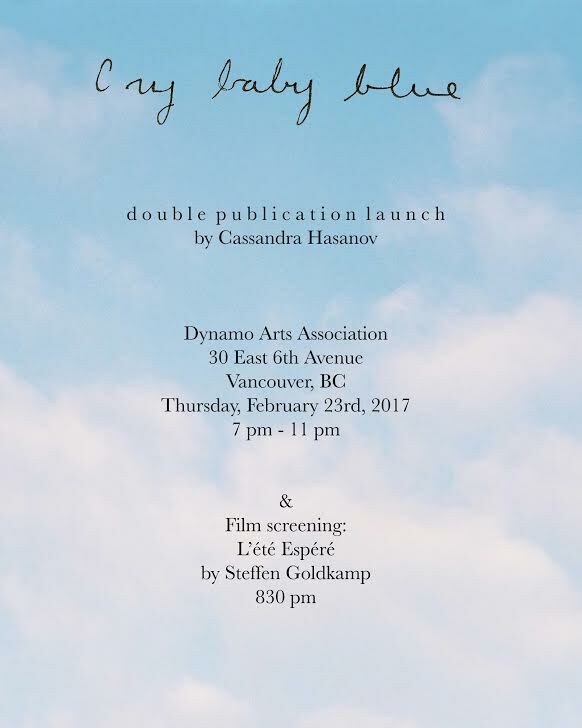 Join us for an evening of whimsical blues at Dynamo Arts Association for the launch of Cassandra Hasanov's two publications and a short film screening. Volume One presents the artist's photographs of the sky during her stay and studies at École nationale supérieure des Beaux-Arts de Paris in 2015, alongside a paint chip found in Vancouver, Canada. Volume Two is a series that presents paint chips in shades of blue renamed with titles of songs from the blues genre of music. During the evening there will be a screening of the short film L'été Espéré from the German director Steffen Goldkamp. Filmed during the summer of 2015, the film follows a handful of protagonists as they journey through the streets of Paris in today's modern world. Fill out the contact form below if you are interested in participating in an upcoming Print Ready group exhibition, or if you wish to coordinate a release event for a specific work. Send us a link to your website or an image of your work, with a few sentences of description. Please indicate the format, size, and type of binding (if any) of the proposed work you wish to show.